ABBOTT MOTORS, An exceptional car buying Experience, is offering this exceptional vehicle for sale. ABBOTT MOTORS has over 50 years of automotive experience! We are also a CARFAX Advantage Dealer. We offer great deals and specialize in FINANCING FOR EVERYONE-ALL CREDIT APPS ACCEPTED! We look forward to helping you purchase your next vehicle. CALL or TEXT (716) 229-5711 for quick answers to your questions about this vehicle. Your message will be answered by a real human never an automated system This Toyota includes: FOG LAMPS Fog Lamps SPORT APPEARANCE PKG Fog Lamps Sliding Rear Window Privacy Glass RUNNING BOARDS Running Boards/Side Steps TOWING HITCH RECEIVER Tow Hitch Your buying risks are reduced thanks to a CARFAX BuyBack Guarantee. When Toyota created this vehicle with 4 wheel drive, they immediately enhanced the performance ability. Easily switch between two and four wheel drive to take advantage of the improved steering and superior acceleration. Low, low mileage coupled with an exacting maintenance program make this vehicle a rare find. Pre-owned doesn't have to mean "used." The clean interior of this Toyota Tundra 4WD Truck makes it one of the nicest you'll find. 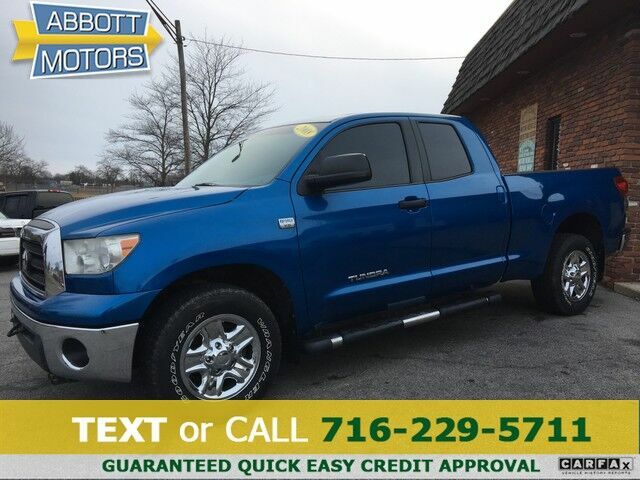 The perfect balance of speed and control has been injected into this 2008ToyotaTundra 4WD Truck. The Toyota Tundra 4WD Truck SR5 is in a class on its own. So much so, that Toyota didn't miss a beat when they loaded this vehicle with an abundance of a-la-carte options. This vehicle comes equipped all-terrain tires. The first thing anyone notices about your car is the paint job and this car's is near perfect. This rare vehicle is a prime example of automotive engineering perfected. More information about the 2008 Toyota Tundra 4WD Truck: The 2008 Tundra CrewMax has best-in-class legroom, according to Toyota, and offers the only reclining and sliding rear seat among pickups. The Tundra also offers one of the best-designed interiors, with plenty of storage space and easy access to the backseat area. The 5.7L engine is more powerful than what's offered by some of Tundra's competitors, with hauling and towing ability near the top of the segment. Safety is also a strong selling point; it's the first full-size pickup to have stability control, front side air bags, and rollover-sensing side-curtain air bags standard across the model line. Interesting features of this model are performance with 4.7L engine., Safety features, thoughtful interior design, and towing and hauling ability STOP IN TODAY or Apply Online 24/7 at Abbottmotors.com ... All Trade-ins Welcome... Same Day Delivery... Call or Text Today and See The Difference... We Look Forward to Serving You! !This vehicle may be subject to potential open recall(s). Vehicle recall information may be found at Safecar.gov. Please verify price, equipment, options and features with your sales rep before your purchase. We Look Forward to Serving You. *Tax, title, plates extra. All Financing On Approved Credit. BBB accredited A+ member.